TAOISEACH Leo Varadkar has said he didn't know Conor McGregor would be marching in the Chicago St Patrick's Day parade and said he didn't think the controversial UFC fighter was representing the country. 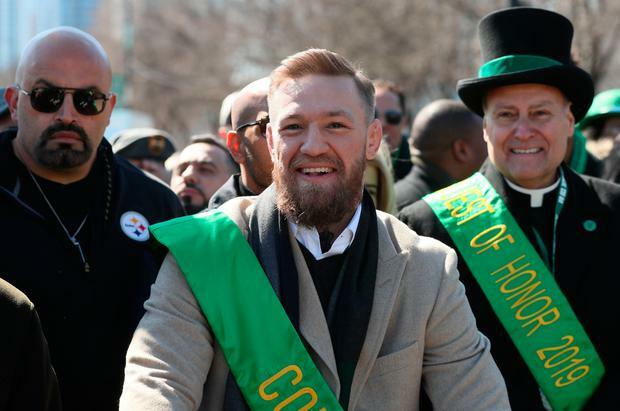 McGregor took to the streets of the Windy City, walking alongside the mayor of Chicago, Rahm Emanuel - a one-time chief of staff for former US President Barack Obama. Mr Varadkar and rural development minister Michael Ring also took part but the Taoiseach was not walking directly beside the Dublin-born fighter. Mr McGregor hit the headlines last week and faces up to 15 years in prison in the US after allegedly smashing a fan's phone in Miami. He previously avoided a criminal record after he pleaded guilty to disorderly conduct at a UFC event in New York last year. "I imagine the parade organisers invited him, but that’s it really." He said he didn't have any discussion with Mr McGregor. Mr Varadkar was asked if it was appropriate that Mr McGregor was representing Ireland given his conviction for disorderly conduct. He replied: "I think that is up to the organisers of the parade to decide who they want to march in the parade". The Taoiseach added: "I don’t think he was representing the country, that’s kind of what I was doing and Mr Ring." Yesterday afternoon the mayor Mr Emanuel described Mr McGregor as a “special visitor”. Later Mr Emanuel appeared to scramble to acknowledge The Taoiseach had also been there and posted a series of Tweets about Mr Varadkar. In another post he said: “Today is a great day to celebrate the contributions of the Irish to the cultural, civic and economic vitality of Chicago. It is also a day to celebrate the city’s history of bringing people together from different parts of the world. Thank you, again for joining us @CampaignforLeo”. The massive Chicago parade lasts three hours and features marching pipe bands and Irish dancers. A highlight of the day is the Chicago River being dyed green. During the week police in Miami charged Mr McGregor with "strong-arm robbery and criminal mischief" after the alleged incident outside the Fontainebleau Hotel on Monday night. Strong-armed robbery, a theft involving violence, is a second-degree felony in the state of Miami. Conviction of the charge can lead to a heavy fine and a prison sentence not exceeding 15 years. "I believe at the end of the day that we will successfully defend this case," Sam Rabin told 'Newstalk Breakfast'. McGregor previously avoided a criminal record after he pleaded guilty to disorderly conduct at a UFC event in New York last year. Several people were hurt when he hurled a trolley at a bus, smashing a window, as it left the Barclays Centre in Brooklyn in April. Meanwhile, US President Donald Trump wished people a “Happy St Patrick’s Day’ on Twitter. He also shared pictures of himself and Mr Varadkar at Thursday’s shamrock ceremony and the White House fountain dyed green.